If you’re an Android loyalist, we’ve got just the app for you. 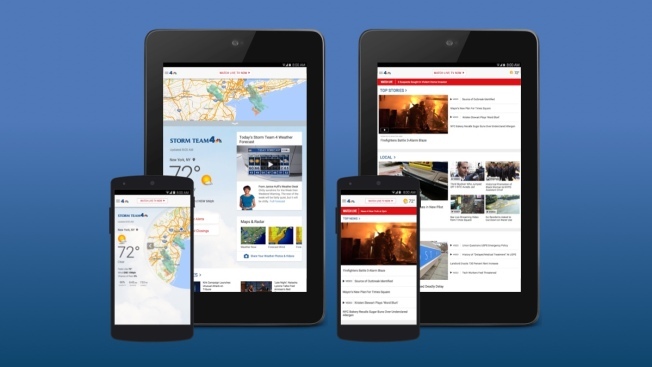 Our NBC New York Android app has been completely redesigned, providing a new look and feel as well as improvements to both performance and usability. If you’ve never downloaded our Android app before (or if you did in the past but decided it wasn’t for you), it’s time to give it a shot. Click here to download it from the Google Play store. Here is a rundown of some of the changes -- both big and small -- that we’ve made to the Android app to enhance your experience. We’ve given the app a complete overhaul, highlighted by a sleek, new design to make it easier to find the breaking local news and weather coverage you care about. There is an increased focus on breaking news, weather and video -- both live streaming and on-demand clips. Multiple articles and videos now can appear in the expandable alert bar. Look for the red arrow when breaking news happens. We’ve also upgraded our video player, so you can play video and scroll through an article at the same time, or rotate your device to watch the full-screen video. To enhance your weather experience on the app even more, we’ve totally redesigned that section, as well, making it interactive and informative. You will find both a quick glance at your day ahead and more in-depth data to help you plan your weekend and beyond. Weather fans rejoice! You can customize the start screen of our app to highlight news OR weather when you open it. If weather information is crucial for you and your family, we want you to see it immediately on the app to make your life easier. If you’re more interested in local and national news, you can continue to see that first when the app opens if you want. To make a change, tap on the main nav icon in the upper left and then tap on “Set Your Start Screen” to choose between "Top Stories" and "Weather." An improved interactive radar is front and center on the weather section. We’ve improved the performance of the radar, giving you more control when tracking storms in your area. Add additional layers for an enhanced experience. And our new severe weather notification system allows you to receive timely push alerts for multiple locations, whether it be your home, workplace or your even your children’s school. To turn on notifications, go to the weather section of the app and tap on the city name at the top of the page. You will see an “Alerts” toggle on the right side for each city you enter (you can search to add more cities). Tap on the “Preferences” tab to view all of the different types of alerts you can receive. We’ve spent a lot of time improving all aspects of our Android app, and we hope you’ll make it your go-to app for local breaking news and severe weather. All of these enhancements also can be found in our iOS app. Click here to download any version of our app that works on your mobile device. If you have any questions or concerned, feel free to view our FAQ or send an email by clicking here.